Efficient production equipment also controls raw material costs. Portioning is a fundamental part of food processing; so basic in fact that you might not expect to have to think about it much. However that part about it being fundamental means that food processors do need to pay pretty close attention to it. "The basic function of a portioner in the food industry is to convert a mass of product into individual portions, usually equal in weight, and in the shape or form the producer needs," says John McIsaac, vice president of strategic business development with Reiser Inc. (www.reiser.com), Canton, Mass. "This basic task can be a sausage portioned into a casing, a loaf of dough divided into a portion or a portion of cream cheese deposited into a cup," he continues. "The most common criteria for success are accurate weight, gentle handling, proper form and delivery at the proper time, into a tray, timed to a proofer, and so on." That's a good concrete description of portioning, but there is more to the story, says Craig Colegrove Sr., sales manager for NuTEC Manufacturing, (www.nutecmfg.com) New Lenox, Ill. "It is hard for me to discuss portioning without the word control following it immediately," he says. 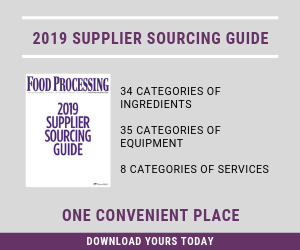 "In the meat and food processing industry, the ability of an owner-operator or corporation to establish and control portions really means the ability to establish and control material costs as well as labor cost in the manufacturing of a product. Once you can establish and control these parameters, it then becomes possible to manufacture given products with a researched margin structure and hopefully compete and sell into the marketplace for a profit," Colegrove says. Fairly basic, too, was the equipment for portioning; at least that was the case a few years ago. That too is no longer the case. "In the beginning it was simply the desire to increase manufacturing capabilities," Colegrove says. "Bigger was better, and faster was better, and so forth, all to increase production. These needs to increase production, however, made it necessary for equipment manufacturers to develop new technologies to handle and manipulate larger quantities of raw materials at a wide variety of consistencies and temperatures -- all the while making exact portions, in exact shapes, in fractions of a second. No small task! Basic mechanical systems eventually gave way to more powerful hydraulic and servo systems." The meat and frozen foods sectors are two of the heaviest users of portioning equipment. As consumers have come to expect it, food manufacturers continue to offer more variety of product types, sizes and shapes. "We now have to not only deliver precise and accurate portions weights and shapes but to do so in a manner that provides for enhanced cooking characteristics, better particle definition and on and on," Colegrove says. "Close proximity portion depositing has been on the increase, and the innovative design of our C-Frame machines have made them even more popular in applications for things like hand-held sandwiches, empanadas, tortilla shell depositing et cetera. The ability of our C-Frames to precisely portion in these applications with excellent particle definition and piece identity has led to an increase in the demand of these specialized units." In all segments of the food industry, processors are using higher-value raw materials, and are therefore more concerned with limiting waste. Above all else is the ever-present concern about food safety, says Reiser's McIsaac. "The consumer speaks, and the food industry listens," he says. "People are first and foremost concerned about the safety of their food. The producers are concerned about this risk, as well as their reputation. Hygiene has been elevated at the portioner. In bakeries, where aluminum once was OK, today only stainless steel will do." There is also raw material pricing pressure that drives the need for extremely accurate portions, McIsaac adds. "Inconsistent portioning results in giveaway," he says. "While this is fairly obvious, under- and over-weights present other problems in production. For instance, if a meatball portioner is not accurate, the cook time will need to accommodate." Colegrove agrees that regulatory and retailer concerns have led to increased emphasis on sanitary design. "That has been a huge factor for us in making material changes and systems changes in order to be able to manufacture in a more safe and wholesome manner," he says. Some of the newest equipment includes precision cheese shredding units designed for pizza making, and the latest gear for forming burgers in a very specific fashion, McIsaac says. "We are having a run on our equipment to form home-style patties," he says. "Interleaved with paper and stacked, they look and eat like they are made by Mom."